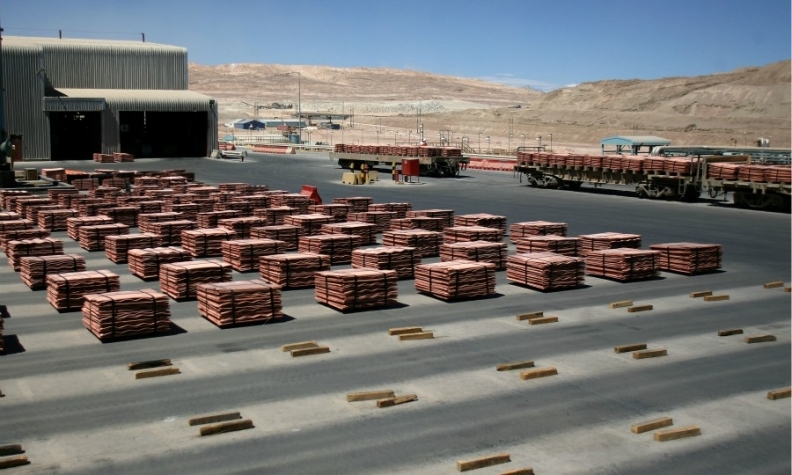 Sheets of copper are pictured at BHP Billiton's Escondida, the world's biggest copper mine, in Chile. SINGAPORE -- The push toward electric cars could lead to shortages in raw materials such as copper, mining group BHP said. The EV boom would be felt - for producers - first in copper, where supply will struggle to match increased demand, said Arnoud Balhuizen, BHP's chief commercial officer. The world's top mines are aging and there have been no major discoveries in two decades. The market, he said, may have underestimated the impact on the red metal: fully electric vehicles require four times as much copper as cars that run on combustion engines. Europe has begun a dramatic shift away from the internal combustion engine, although, globally, there are only roughly 1 million electric cars out of a global fleet of closer to 1.1 billion. BHP forecasts that could rise to 140 million vehicles by 2035, a forecast it says is on 'the greener' end. "The reality is a mid-sized electric vehicle still needs subsidies to compete... so a lot will depend on batteries, on policy, on infrastructure," Balhuizen said. EVs are expected to soon cost the same as traditional vehicles - as early as next year by some estimates. But governments are also getting on board, with China's subsidies leading the way and the UK becoming the latest country to announce its all-electric ambitions in July. Balhuizen said this year looks set to be the "tipping point" for electric cars, echoing comments by automakers such as Renault that EVs may now take off due to their longer range. BHP, Balhuizen said, is well-placed for copper, with assets such as Escondida and Spence in Chile, and Olympic Dam in Australia. BHP said last month it was spending $2.5 billion to extend the life of the Spence mine in northern Chile by more than 50 years. For oil, though, the impact of the EV boom may take longer to be felt. Balhuizen said in the nearer term, over the next 10 to 15 years, improvements in the internal combustion engine will be a more significant drag on demand. China's efforts to build a new Silk Road are another major factor influencing commodities demand in the near term, and BHP estimates the impact on steel alone at 150 million tons of new demand, Balhuizen said, mostly to be used in structures and reinforced concrete. Spending could top $1.3 trillion. China produced just over 800 million tons of steel in 2016. There is little question Asia requires more spending on infrastructure - the Asian Development Bank estimates that Asia requires $26 trillion in infrastructure investment by 2030. Per year, that is more than double current spending, BHP said. Belt and Road, as the giant initiative is known, is a "tremendous opportunity", he said, acknowledging that there was a risk that big slogans may struggle to translate to profit. Along with the rest of the commodities universe, BHP has benefited from rising prices over recent months - copper, for example is close to three-year highs, boosting cashflows. The return of growth has not turned BHP away from its push for efficiencies, Balhuizen said, but efficiencies will not mean further reducing the portfolio of commodities for now, he said, brushing off criticism from some investors over BHP's oil assets. "The diversity of our portfolio does create value. We get better credit ratings, we get a lower cost of debt," he said, pointing to applications in potash of techniques honed in oil. "It is very tangible, very clear."